Since the computer?based test’s (CBT) launch in April 2004, the number of examinees has been increasing, with over 85,000 having taken the Uniform CPA Examination in 2008, which is more than the estimated number who tested in the last pre?CBT year, representatives of the AICPA’s Board of Examiners told the Regional Meetings. July 2009 will see the millionth examination launched, BOE Chair Colleen Conrad (MO) and BOE Vice Chair Douglas Warren (TN) reported to the NASBA audiences. On May 15, 2009 the BOE approved the revisions to the CPA Examination’s Content and Skill Specifications to include International Financial Reporting Standards and, during the first week in August 2009, the BOE plans to announce the implementation date of a new release of the CPA Examination (dubbed the “CBT?e”), the BOE speakers said. Among the major changes to be included in the CBT?e are: 6?7 short task?based simulations in the AUD, FAR and REG sections of the Examination, replacing the current two simulations; three essays only in the BEC section, replacing the two essays now in each of the AUD, FAR and REG sections; faster score reporting a few months after CBT?e is implemented; adjusted section time allocations; implementation of the revised Content and Skill Specifications; and authoritative literature changes required by the FASB’s standards’ codification and Prometric’s server software upgrading. 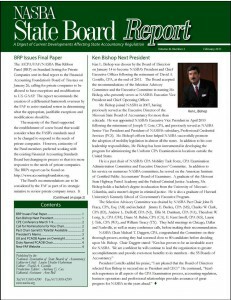 Copyright © 2006 – 2019 National Association of State Boards of Accountancy, Inc. All rights reserved.